If you have accounts at any of the service partners listed below that are managed by Vancity, you can establish links with those accounts to view transaction history, balances and account details in your online banking at Vancity, providing you with a more complete picture of your finances. Currently this feature is only available for our personal banking members and is not available in the Vancity mobile app. To add your Credential Asset Management or Credential Securities accounts, scroll down the Account Summary page until you find the Credential Accounts header. You can add your Qtrade Investor account under the Qtrade header on the Account Summary page. Enter the Client ID or Account number from the service partner account. This information can be found on your most recent statement. For Credential Securities, use the first six digits of your account number without a hyphen (e.g.if TFSA Account Number is 1A1-111-A-1, enter 1A1111). Review the personal information on this screen that has been pre-populated from our banking system. If the information is correct, click the Continue button. If the information is incorrect, please contact our Member Services Centre. If the account links successfully, you will be redirected to a page similar to this to confirm the linking. If your account does not link and you receive an error, please contact our Member Services Centre. Once your account is successfully linked, click on My Accounts to see your investment accounts displayed on the Account Summary page. Please note, the balance displayed is the last closing price on the day indicated in the ‘As of’ column. In order to display your wealth account information, the contact information in your Vancity profile must match the contact information in your partner account profile. If you are unable to link, please contact the Vancity Member Services Centre to review your contact information in our banking system. Here are some tips that will help if you have successfully linked your investment account but the information is not displaying in online banking. If there is still an issue, please contact our Member Services Centre. 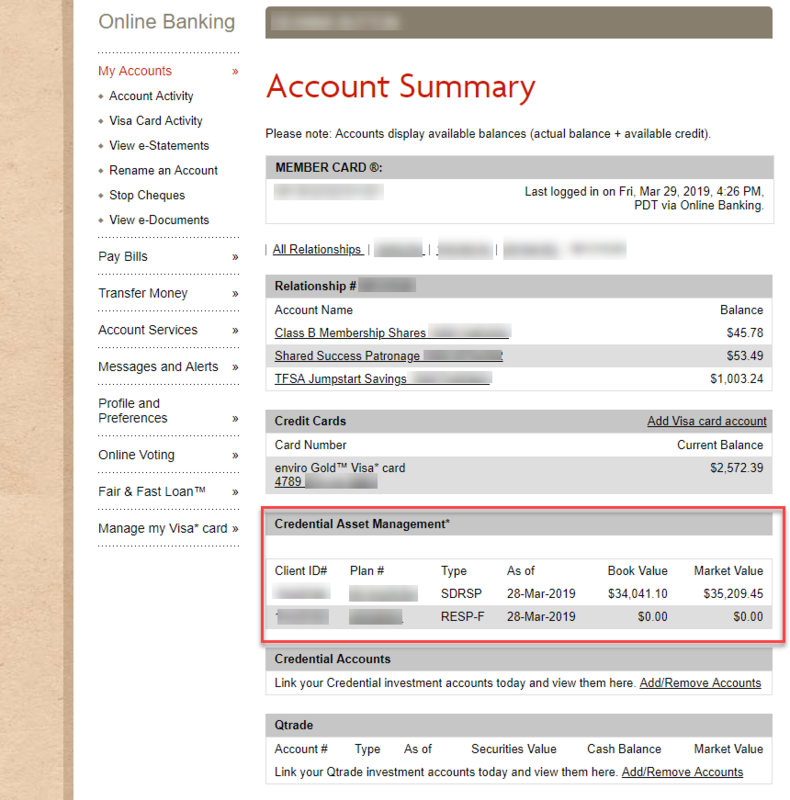 Can I transfer funds into my investment accounts in online banking? At this time, you will need to make an appointment with your Wealth Planner of Wealth Advisor to add funds to your Credential Asset Management or Credential Securities accounts. The account information is ‘view-only’ in online banking. For Qtrade Investor, you can transfer funds as a bill payment. Can I remove linked investment accounts? 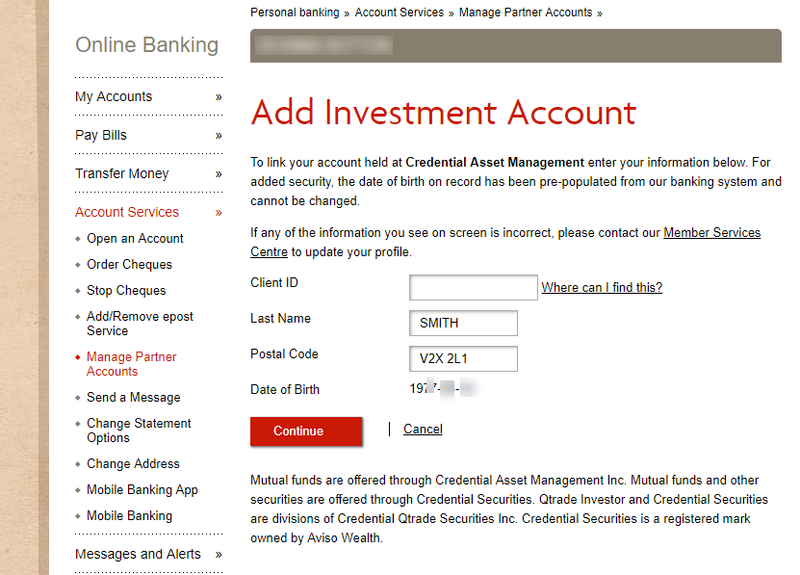 For your convenience, Vancity has provided a service that allows you to link your Credential Asset Management, Credential Securities or Qtrade Investor account and view that information in Vancity online banking. However, Vancity accepts no liability for the accuracy of the information being provided. Online brokerage services are offered through Qtrade Investor. Mutual funds and other securities are offered through Credential Securities. Qtrade Investor and Credential Securities are divisions of Credential Qtrade Securities Inc. Credential Securities is a registered mark owned by Aviso Wealth. Mutual funds are offered through Credential Asset Management Inc. Qtrade Investor, Credential Securities and Credential Asset Management are separate legal entities from your credit union. Mutual funds and other Securities purchased through these entities may fluctuate in value and are not insured by a government deposit insurer or guaranteed by your credit union.